Whether you can feel it or not, there’s moisture in the air and those tiny droplets of condensation are bound to make their way into your compressed air system. But, as we all know, the air must be dry in order for the system to work properly. Because air compressors are used for a wide range of applications, there isn’t one perfect solution when it comes to removing the moisture. We’ll explain a variety of applications so you can begin to understand which solution is the best for removing water from your compressed air system. All pressurized air systems need some type of device to remove the moisture that naturally occurs. Some solutions are as simple as utilizing a drain valve, while others are more complex and involving multi-stage air drying systems. To determine the best way to remove the moisture, you have to consider what type of air compressor you’re using, and what the application is. There are some compressed air applications that can handle a relatively low moisture content so they don’t need an elaborate air-drying setup. Regardless, moisture or liquid in the compressor tank and lines is not ideal, so drying the air and releasing the water in one form or another is a necessity. There’s a drain at bottom of your air compressor tank that releases the water and oil mixture that collects at the bottom. Ideally, you’ll want to drain this every time you use your air compressor to prevent rust from building up inside the tank and to keep moisture out of your lines and tools. If you’ve been avoiding draining your tank because it’s difficult to reach the drain valve, you can install a drain extension kit which makes makes it easily accessible. You can also install an automatic tank drain that will drain the tank for you after a certain period of time. Either way, this is a step that should not be skipped. Typically not used on its own, a water trap is part of a multi-step system to remove as much moisture from the air as possible, especially for applications that require extremely dry air, such as painting, sandblasting or powder coating. A water trap and filter regulator system is designed to work with incoming cool air that enters one side, then circulates around the bowl where the water collects at the bottom of the trap and drains out. The air will exit through a filter, which traps other impurities in the air. Learn more about the filtration options we offer. While filters and separators are able to remove liquid moisture droplets from a compressed air system, they cannot remove water vapor. In order to remove water vapor you must use a dryer. Cooler air holds less water, so it uses more than one system to cool the compressed air, allowing the water to drop out of the air where it can be collected and drained. A refrigerated air dryer works like an air conditioning unit. It is connected to the air compressor and cools the air to a specific temperature, usually between 35˚F and 50˚F. The result is a pressure dew point (PDP) of 33˚F to 39˚F. The water drops out of the air and is separated, then the air is heated up and sent through the lines for its end use. Some applications require a lower PDP, which would require a desiccant air dryer because the condensate will freeze at 32˚F and cannot be removed. Because this method can be costly, it’s not always the first choice for customers, however, it is one of the most efficient ways to remove moisture from compressed air and it contains a complete drying system in one unit. In industrial operations, water vapor in compressed air equipment can lead to premature failure, corrosion, frozen air lines, quality control issues and a range of other operational problems. A desiccant air dryer system purifies compressed air by absorbing moisture and provides air purification from -40°F PDP down to -100°F PDP. QHD Heatless Desiccant Dryer The QHD series desiccant dryer includes 13 models that deliver between 230 and 3,400 CFM of clean, dry air at a pressure of 100 psig. All feature a heavy-duty steel base and dual tower configuration that regenerates automatically. The heatless desiccant dryer uses a small portion of dried, compressed air to purge and regenerate the off-line tower. QHP Heated Purge Desiccant Dryer The QHP series heated desiccant air dryer features a built-in heating system that regenerates the offline tower using half the amount of air as our heatless dryers. This translates to improved efficiency, less wear and lower operating costs overall. QBP Blower Purge Desiccant Dryer These dryers combine heat with forced ambient air for regeneration. As a result, they have a lower purge requirement than both the QHD and QHP desiccant dryer systems. QMOD Heatless Modular Desiccant Dryer These compact dryers use a small portion of dried compressed air to regenerate the offline tower. With 15 available models, these units have a small footprint that has been designed to save floor space without compromising performance. If you’d like more information about each of the desiccant dryers we offer, click here. You can plumb your air lines to remove moisture from compressed air. By using longer lengths of metal piping built into two or more up-and-down patterns, the air is cooled as the piping absorbs the heat. 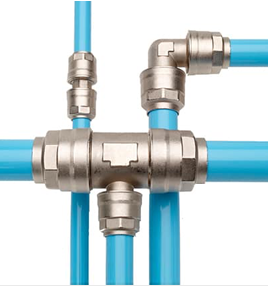 Reacting to gravity, the water drops to the bottom of the piping system into a drip leg and gets trapped, either by a water trap or a T-fitting and ball valve. The air continues along the up-and-down piping, releasing more moisture through each segment so each drip leg will have less water. By the time the air moves through the last segment, there should be no water left in the drip leg. This can be used as a solo method of drying compressed air and it’s the most common and cheapest way to dry compressed air, either for business or personal use. What is your dew point requirement? What utilities do you have available? What is your ambient air temperature? What is your operating pressure? What is your inlet air temperature? 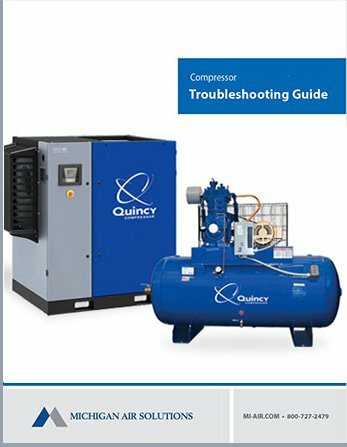 You’ll also need to consider the capacity (CFM rating) and pressure (PSIG) of your air compressor. You must choose the right size for your compressed air drying system and the application. Of course, purchase price is something to consider as well, but the energy use, maintenance costs, and additional cost of the pressure drop that will occur as your compressed air travels through another system should be taken into consideration. You will need to run your compressor at a slightly higher pressure with an air dryer to compensate for the loss of pressure through piping, or run it with a dryer unit to achieve the same pressure for end use. If you try draining your tank and utilizing a dryer system and you’re still having issues, one of our maintenance teams can review your system and get you up and running properly. 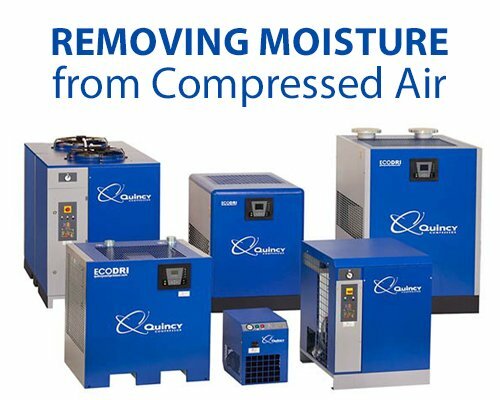 If you have questions on which system is the best to remove moisture from your compressed air system, give Michigan Air a call today. We sell new and used equipment, and we have maintenance teams throughout the state of Michigan.